Hang gliding can be dated back to the days of Leonardo da Vinci, whose sketchings portrayed his desire for human flight. Through fact and fiction, silent aviation has played a major role in man's dream to soar with the birds. Once you have tasted flight, you will walk the earth with your eyes turned skyward, for there you have been and there you long to return. Hang gliders have evolved from Francis Rogallo’s original flexible wing (as described in the History) into modern day flying marvels. Hang gliders are now made of aircraft aluminum or carbon fiber, stainless steel cable and Dacron (the same material sailboat sails are made of) and weigh between 45 lbs. and 90 lbs. Although gliders normally fly between 20 and 30 mph, they can reach speeds in excess of 80 mph and have a glide ratio of up to 16:1. That means they fly 16 feet forward for every foot of altitude they lose when flying in calm air. Hang gliders can withstand more G-forces than many single engine aircraft and can be folded up into a bag that is 16’-18’ long and a foot in diameter and easily transported on the roof of a car. Pilots' prone position when flying gives hang gliding the feeling of flying like a bird. Paragliding has a huge following all over the world, and all the equipment fits in a backpack weighing anywhere from 25-50 pounds depending on your equipment choices. This is the most practical type of aviation on the planet. Everything you need to fly fits in your backpack, which you can check onto a plane or put in the trunk of your car as you travel. The lightweight kits make it very accessible to hike to launches. Like other aviation, paragliding is dependent on weather, maturity and judgment, and the pilot’s ability to make good decisions. You can enjoy paragliding if you’re a 12 year old girl, an 80 year old man, or someone in between. Paragliding is the most practical way to live amongst the clouds and soar like a bird. Transport: Hang gliders typically weigh more than 50 pounds, can be carried balanced on your shoulder, and require a roof rack to transport on a vehicle; paragliders typically weigh less than 50 pounds, are carried in a backpack, and can fit inside a vehicle. 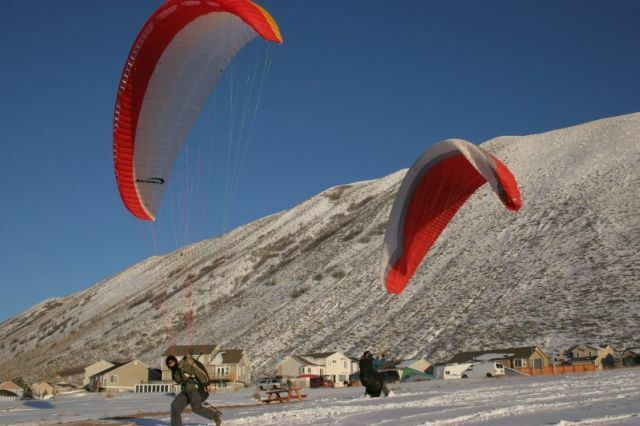 Set-up: Hang gliders fold up for transport and take about 15 to 20 minutes to set up and prepare to launch; paragliders are packed completely assembled and take about 5 to 10 minutes to set-up and prepare to launch. Flight: Hang gliders are more streamlined and are capable of much faster speeds, improved glide ratios, and the ability to fly in stronger conditions as compared to paragliders; due to their slower speed, paragliders can typically land in much smaller fields. In order to fly for hours and for long distances a glider needs to be able to gain altitude or, at a minimum, maintain altitude. This is a challenge since hang gliders and paragliders do not have engines. Like a giant paper airplane, once airborne, a glider is constantly being pulled down toward the ground by gravity. The only way to combat this is to get the glider into air that is rising faster than the glider is descending. The result will be that the glider is able to gain altitude or at least maintain its altitude. There are two different ways this can happen. The first is by circling the glider in a thermal, which is a column of warm rising air. The other is by flying the glider in “ridge lift” which is created when wind hits an obstruction like a mountain or hill and gets deflected up the face of it. As long as the glider stays in the upward moving air it will stay aloft, but as soon as it flies out of the upward moving air, the glider will start to gently descend again. Circling with a bird in a thermal or flying over a local mountain range is an experience that will never be forgotten. 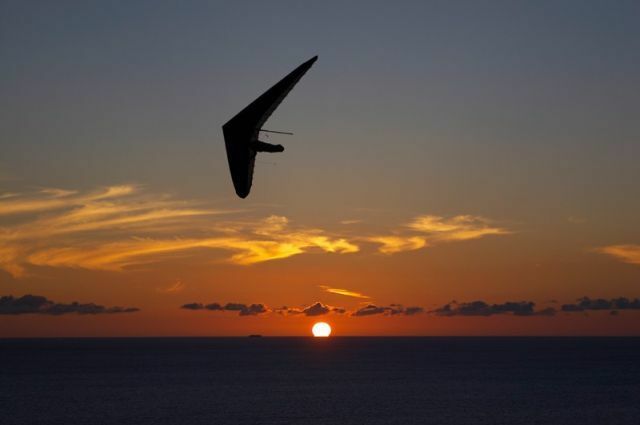 There are many different levels on which hang gliding and paragliding can be pursued. There are those who enjoy simple top of the hill to bottom of the hill sled rides. Some enjoy soaring in smooth ridge lift. There are those who want to gain thousands of feet of altitude and fly long distances. The current world record (as of January 2018) for straight distance in paragliding is 564 kilometers (350 miles) and for hang gliding is 764 kilometers (475 miles) - set in 2012 by US pilot Dustin Martin launching from Zapata, Texas and flying nearly across the entire state! This is a sport of progressions – it is truly a lifelong sport with a lifetime of learning.